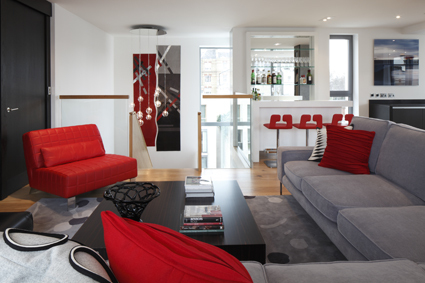 Just received the fantastic photos taken by James Balston of a penthouse flat I’ve designed in London. 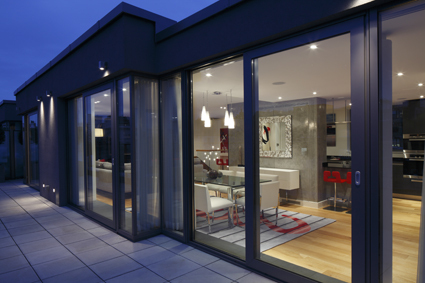 I had some great clients who trusted me to give them the contemporary London home they dreamed of. 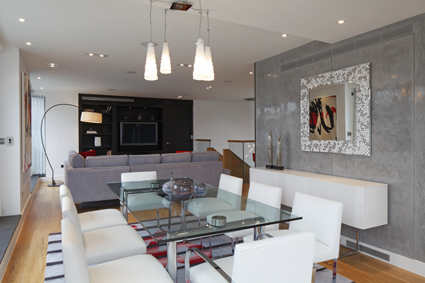 The whole flat was inspired by urban London living, with all the artwork bought or commissioned from British artists. If you look closely you’ll see two large versions of my Urban London Graffiti rug (under the dining table) and Pavement rug (in the living area). 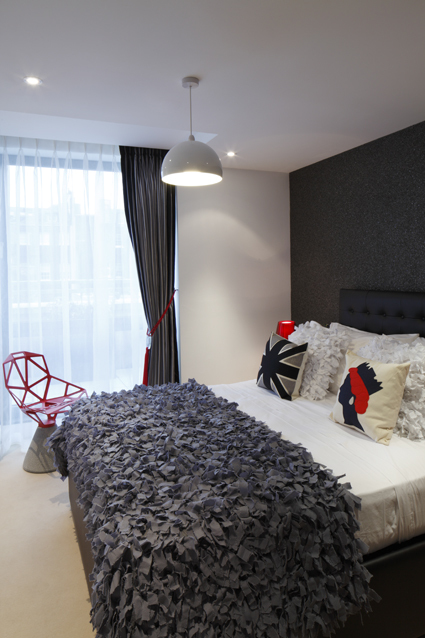 One of my Urban London glass tiebacks was used in a guest bedroom too. 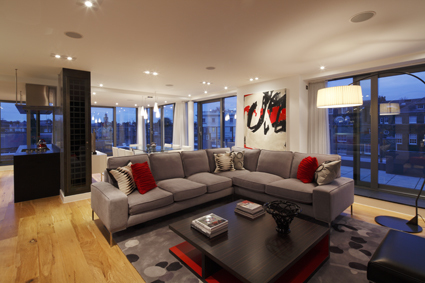 The colour palette throughout was based on tones of grey, white and black, with red accents. 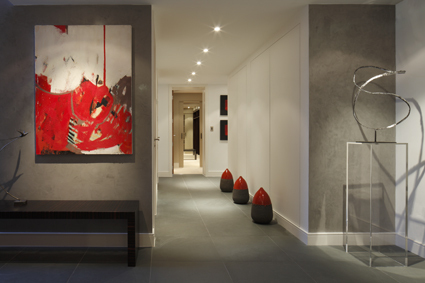 Grey polished plaster was used to create feature walls in the dining room and entrance hallway, and Morocco tadelakt (a waterproof polished plaster) was applied to all the bathroom walls to give them sheen and texture. The terrific carpentry company Millworks made and installed the smoked oak media wall and white Corian bar in the living room to my design. Beautiful black lacquered 1950s cabinets were bought for the master bedroom and I designed a large black chest of drawers with horn and nickel handes to work with these. 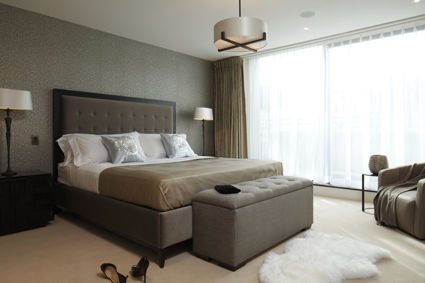 All three bedrooms featured textured wallpapers with chips of polished stone. I’ve just been commissioned to design the exterior terraces, so can’t wait to do these to finish it all off for the summer. Here are a few taster pictures. Photos will be posted onto the Interior Design Projects page of my website soon. Enjoy! 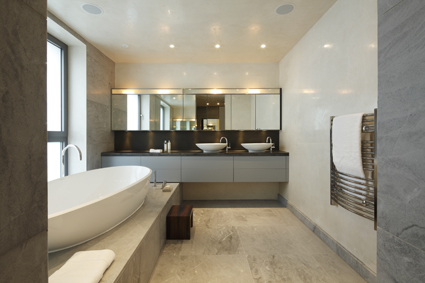 This entry was posted in Bathrooms, Bedrooms, Contemporary Design, Dining Rooms, Interior Design, Living Rooms. Bookmark the permalink. Colors are the important part of Interior Design. If you choose wrong combination it will vanish your work. So it will be great if you take care about the colors while choosing them.